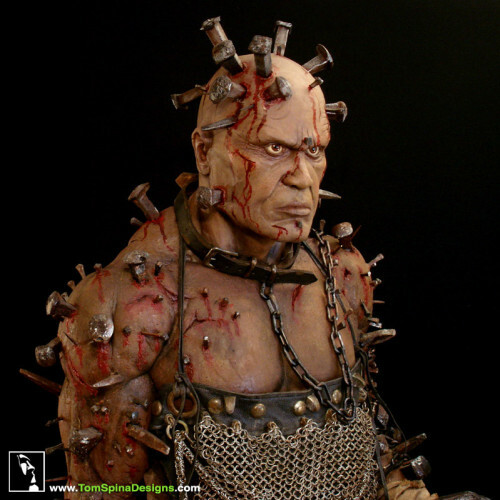 Thirteen Ghosts Hammer custom mannequin – turning a screen worn movie costume into a wax museum figure! An imposing custom display, the Thirteen Ghosts Hammer stands 6′ 4″ tall. Minor restoration was done to the original, screen used foam latex movie costume. 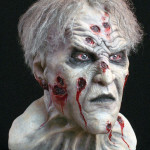 Sculptor Tom Spina custom sculpted and painted head a latex bust for the head, with realistic glass eyes. The spikes on the head are a mix of production-made special effects foam spikes and spikes we made to match the originals used in the film. We also created the custom mannequin made to properly fill out the foam latex muscle suit and turn this into the ultimate life-sized display! 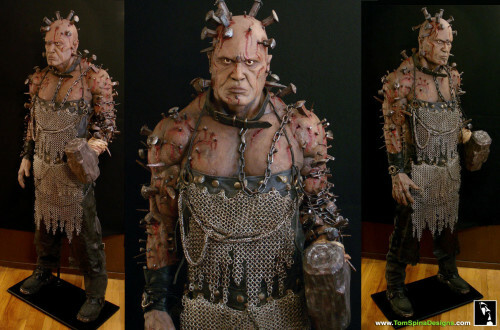 We have created a number of incredible life-sized wax museum style statues to display original movie prop costumes from the 2001 movie, Thirteen Ghosts. In the movie, each ghost had a unique look and bold style. A quick glance at one of them would likely tell you how they lived, or how they died! The Thirteen Ghosts Hammer was a blacksmith who was killed when he was accused of a crime and was executed by having railroad spikes driven through his body, with his own sledgehammer. 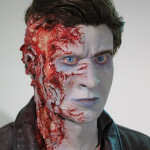 His custom mannequin brings to life (or afterlife!) his character from the film! For these displays, we combine sculpture and custom mannequins to enhance the costumes we were provided. 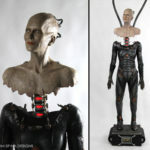 Each statue features a custom sculpted head and customized mannequin to properly fit and support the specific movie costume. 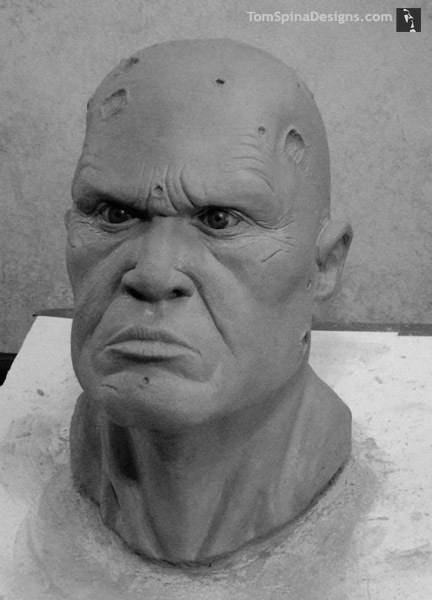 The final results are lifelike statues that are loaded with character for our client’s home theater. 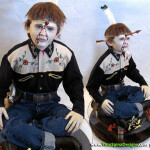 Are you looking for a unique movie costume or prop display?